Miners in Queensland Australia who are employed by the Palmer Nickel and Cobalt refinery had recently heard through the grapevine – they were in for a nice little Christmas surprise for all of their hard work and dedication. Well, that’s nice to hear wherever or whatever kind of work you do, especially if it’s from the heart and it shows that all you’ve done year-long is appreciated by the Boss & company. However… what the Miner and refinery workers were presented with was a coin or token produced in what has been described as base metal at best – chromed ­copper at worst, with their festive spirits certainly deflated at most! 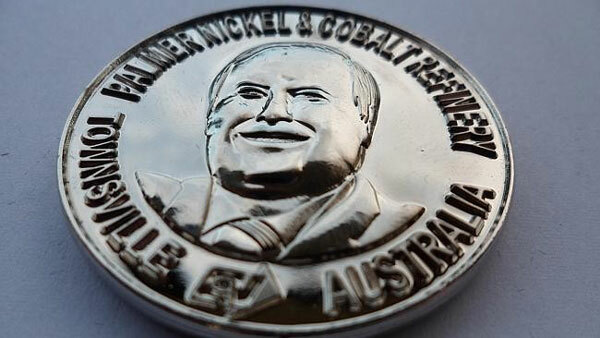 Adding insult to injury, the coin included a front-facing image of the owner of the Refinery’s pudgy face, that of Clive Frederick Palmer – flatteringly described by some as the larger-than-life owner of Palmer Nickel and Cobalt refinery, but often described by many in the media as an individual with very questionable business practices and whose company is being prosecuted for spilling tens of thousands of liters of pollutants from its tailings dams on the edge of Australia’s Great Barrier Reef Marine Park. This supposed gesture of Christmas generosity has been mocked by both supporters and detractors alike with much of the more colorful comments again emanating from the local and national Australian media. The “coin” also includes a reverse image of the Refinery itself and it has been described to have a net worth of about $AUS 2.30 or about two US Dollars. However, there has been for many recipients of this coin, somewhat of a bright or lucky turn of events as several workers have taken to listing the coin on auction sites such as Gumtree. Some examples of this trinket have thus far realized prices of of between 50 and 80 Australian dollars, far greater than their intrinsic value. The coin is being held up as a poor gesture from a man who has substantial resources and as someone “striving for immortality like Caesar and the kings of old” Perhaps adding insult to further injury, The “Clive coin” was also marking a milestone – the production of one million tonnes of nickel over the past 40 years – but the message is being mostly overlooked and ignored due to the criticism of Mr. Palmer’s “uber ego” and the item being used as a Christmas gift. Yes, coins normally DO make great gifts, birthday, anniversary and of course Christmas gifts but – much of the advice towards Clive Palmer would be to spare a thought for the kind of coin you want to give – omit the idea of your own chrome-plated token and just say “Happy Holidays” with a nice Australian nugget gold ounce coin – remember Mr. Palmer, they come in smaller sizes too – much smaller! Ouch! Seems like this boss wanted to gratify their own overblown ego rather than spread the joy of the season. I know someone who on your birthday will send you a message with an image of a coin that has your own face on it, which is a nice touch. It would not be much fun if he sent one with his own face.